Having taken a look at the fishing dock, we walked up a short distance from the harbour and found A Pobra do Caraminal's large square or alameda. In keeping with those of many Galician towns it is now in two distinct sections, the first tiled and the second extensively gardened. To the left you can see part of the hard landscaped section with the gardened area in shadow behind. 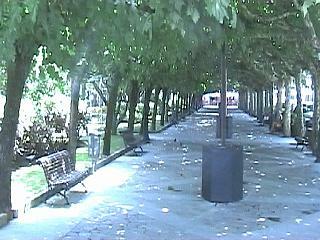 The hard landscaped section of the alameda has light cream coloured tiles and a matching low level wall encircling it. 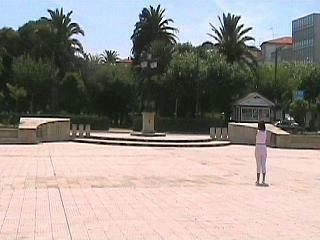 When we visited there was also a large stage temporarily erected at one end of the square. We later learned that this was used for the staging of an annual Galician Ballet later that evening which attracts large crowds from the surrounding area. In order to leave the tiled piazza and enter A Pobra do Caraminal's gardens you cross a road which now bisects the two areas. The gardened part of A Pobra's alameda is nothing short of stunning and without question the most attractive one we have seen in Galicia. 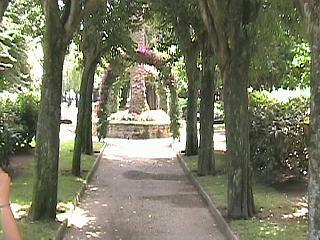 It combines long tree and trellised lined archways of various shrubs (see right) with small lawns and highly coloured flower beds. There are both water features, in the form of fountains, and commemorative sculptures or busts that also add to the display. The fountains also ensure that there is an ever present and relaxing sound of water in motion. If you want to relax, read a paper, or simply people watch, there are numerous benches located around the park where you can do just that. Below, a glimpse of a fountain through one of the tree formed allies in the garedned area of A Pobra's impressive park. As you walk through both the tiled and cultivated sections of the park, the ocean sits to one side of you and the lower part of the town to the other. There are also a number of small bars with tables and chairs outside as you start to exit the gardens and head towards the main hub of A Pobra do Caraminal. In keeping with many Galician coastal urbanizations, the main part of the town runs both parallel with, and up in to the slope away from, the sea. In the case of A Pobra do Caraminal however, this incline is slight and not physically challenging. Additionally most of the town is built on level ground making exploration very easy. To the right is one of the many small, but highly colouful, flower beds in the gardens of A Pobra. 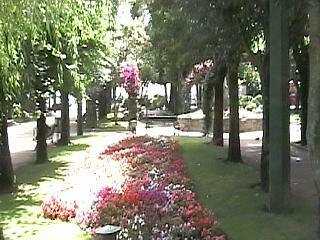 Small flower beds also appear on the streets of this town. The entire park area is filled with these narrow tree and climber lined walk ways, many of which are in flower. All the lawned sections between these corridors are scattered with flower beds and benches creating an ideal relaxation retreat.